Utah's capital and most populous city, Salt Lake City boasts a small-town feel, big-city amenities, and plenty of nature on its doorstep. Kick off your visit on the 11th (Sat): test your team's savvy at popular escape rooms and then contemplate in the serene atmosphere at Temple Square. To see traveler tips, maps, ratings, and tourist information, use the Salt Lake City online trip planner . Washington DC to Salt Lake City is an approximately 7-hour flight. You can also do a combination of train and flight; or drive. The time zone changes from Eastern Standard Time to Mountain Standard Time, which is usually a -2 hour difference. Traveling from Washington DC in May, expect a bit cooler with lows of 51°F in Salt Lake City. Cap off your sightseeing on the 11th (Sat) early enough to travel to Zion National Park. Kick off your visit on the 12th (Sun): explore the striking landscape of The Narrows. Get ready for a full day of sightseeing on the 13th (Mon): explore the striking landscape of Zion National Park. To see other places to visit, reviews, more things to do, and more tourist information, refer to the Zion National Park trip itinerary planning tool . Do a combination of flight and car from Salt Lake City to Zion National Park in 4 hours. Alternatively, you can do a combination of flight and taxi; or drive. Expect a bit cooler evenings in Zion National Park when traveling from Salt Lake City in May, with lows around 41°F. Cap off your sightseeing on the 13th (Mon) early enough to go by car to Moab. 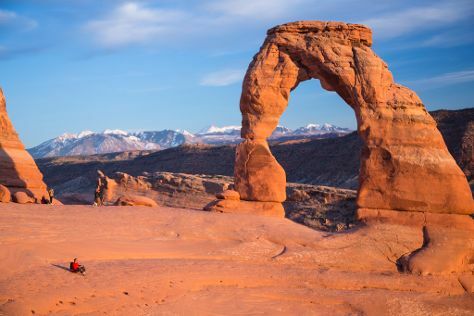 Go for a jaunt from Moab to Arches National Park to see Delicate Arch about 38 minutes away. Make the 14th (Tue) an unforgettable day with an extreme tour. On the 15th (Wed), dedicate a day to the elevated beauty of Arches National Park. The adventure continues: scramble along the landscape with a canyoning and rapelling tour, take in the dramatic natural features at Turret Arch, and look for gifts at Sandstone Gallery. To see reviews, traveler tips, more things to do, and other tourist information, use the Moab visit planner . Getting from Zion National Park to Moab by car takes about 5.5 hours. Other options: do a combination of car and flight; or do a combination of taxi, flight, and car. Traveling from Zion National Park in May, plan for a bit warmer nights in Moab, with lows around 49°F. On the 17th (Fri), you'll have the morning to explore before heading back home.